Email marketing is getting seriously competitive. 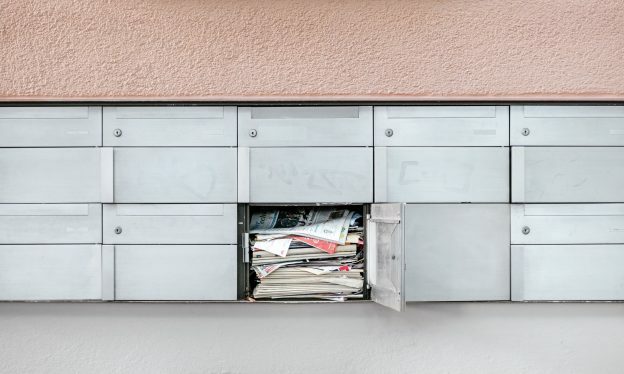 Industry data shows that the number of emails sent and received per day will hit 293.6 billion in 2019 and 333.2 billion in 2022, which means our inboxes are about to get even more crowded. Standing out from this sea of emails requires mean marketing skills and clever ways to keep your subscribers engaged. 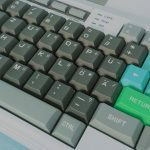 That’s why following email marketing trends is a must – doing so will help you figure out what tactics and tech to adopt, and keep your email marketing strategy in tip-top shape. To help you do that, this post will shed some light on the top email marketing trends you should keep an eye on and try applying to your business. 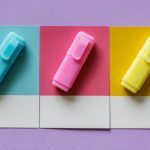 Using visuals in emails isn’t anything new, but in 2019, you should take things to the next level by including interactive elements in your emails. Here are a few ways you can make your emails interactive. This interactive email from Nike uses “hover to view” captions that reveal more details about specific clothing pieces. TOMS uses interactive content to demonstrate the glow-in-the-dark features of their classic shoes. There’s a switch in the email that lets you “turn off the lights” to see the glow-in-the-dark shoes in action. PrettyLittleThing spiced up a promo email by sprinkling in a bit of interactive magic in the shape of a unicorn. As you can see, interactive emails come in many forms and serve various purposes. If you’re intrigued by interactive content, we recommend trying it now, before other brands take note of this exciting trend. 1.4 How to create interactive emails? If you’re not keen on coding, you can look into solutions that can do it for you. One popular tool for creating interactive emails is Zembula. This software lets you spruce up your emails by adding cool features like scratch cards and “peel to reveal.” Best of all, it doesn’t cost much to implement. Zembula comes with a 14-day trial and their pricing starts at $19.99, so you can test interactive emails, see what works, and scale up if necessary. Big data — that fuzzy term used to describe massive sets of data from various sources — has been a buzzword for several years now. And while most of the hype has been focused on enterprises using big data, these days smaller merchants are also becoming interested. 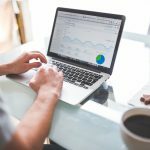 Thanks to innovations in AI and machine learning, there’s a growing number of small biz-friendly solutions that can collect and analyze data from various sources (consensus, consumer behavior, sales and inventory data from different stores), and then serve up insights and recommendations you can use in your business. AI has definitely made email personalization more accurate and efficient. AI-powered marketing software (such as Marsello) can analyze the purchase histories of your customers and people similar to them to serve up customized product recommendations. Here’s an example from RK Collections, an Arkansas-based fashion boutique. RK Collections runs “win back” campaigns to engage shoppers who haven’t stopped by store within the last 30 days. 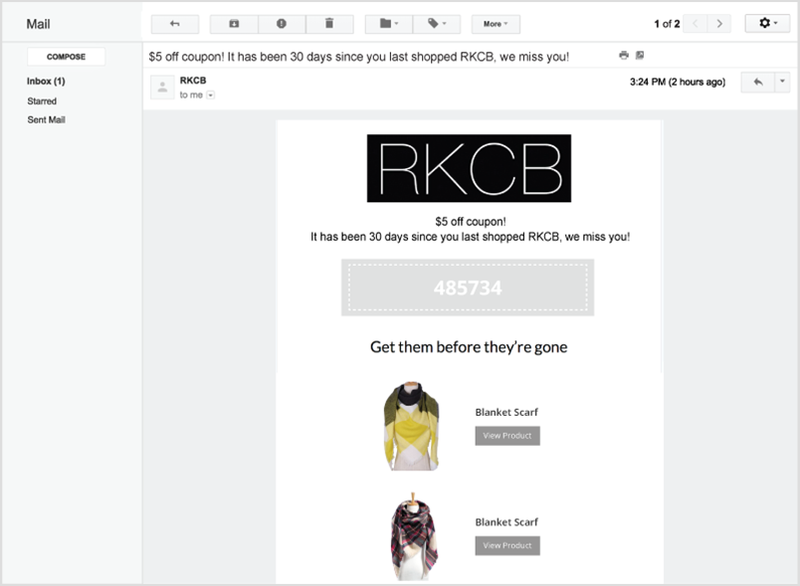 But rather than just sending a generic “We miss you!” email, RK Collections includes item suggestions along with a sweet offer. What’s notable about their campaigns, though, is the fact that their product recommendations are based on each user’s purchasing behavior, as well as the histories of consumers similar to them. Timing matters. Even the most well-written message will yield less-than-stellar results if sent at the wrong time. Unfortunately, email scheduling is tricky to master, as the “right” time depends on the business and niche you’re in. To nail the timing of your messages, you must rely on data – the open and click rates, and conversions of your subscribers. This will give you an understanding of their email and purchasing habits, which in turn can help you optimize your campaigns. However, not everyone has access to their subscriber data or the time to analyze it. And this is where AI can come in handy. More and more email marketing solutions are introducing AI features for optimizing the timing of your emails. Some platforms can now make scheduling suggestions based on your subscribers’ email habits (e.g., what time they tend to open your emails or make purchases) and the habits of people shopping at stores similar to yours. 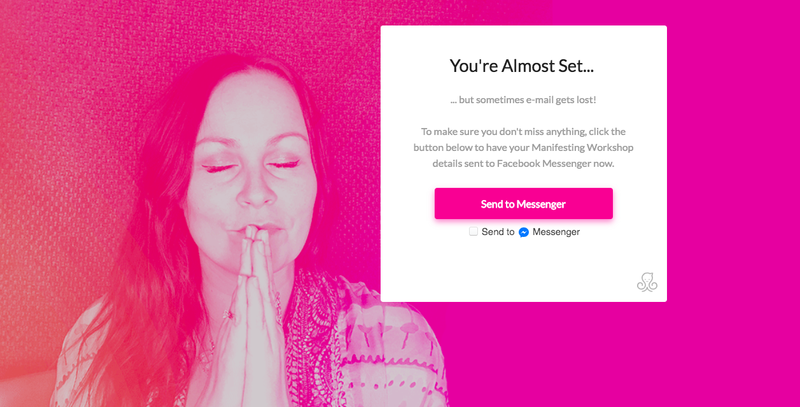 So the next time you’re stressing about when to send out your emails, let AI give you a hand. While it’s true that data empowers marketers to personalize content and experiences for customers, too much of it can do more harm than good. In 2018, marketers learned that too much personalization gives consumers the creeps. In 2019, this feedback will resonate with more and more brands. While it’s unlikely that companies will suddenly stop collecting data, more brands will tone down personalization in their marketing efforts to appear less intrusive in the eyes of their customers. So instead of just showing product recommendations, retailers will be more upfront about why they’re suggesting certain items. In fact, that’s what some of the brands are already doing. 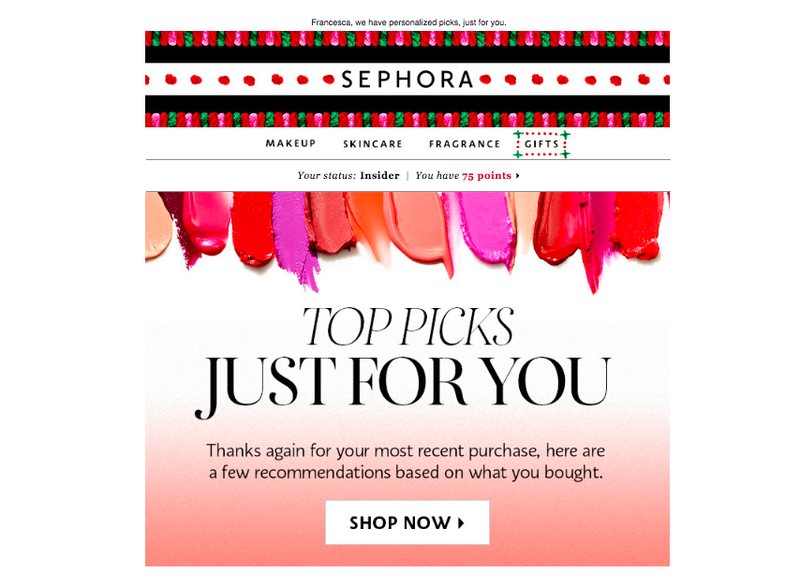 Personal care and beauty store Sephora tells the recipient that their recent purchase prompted a few products picks. “Thanks again for your most recent purchase, here are a few recommendations based on what you bought,” the email read. 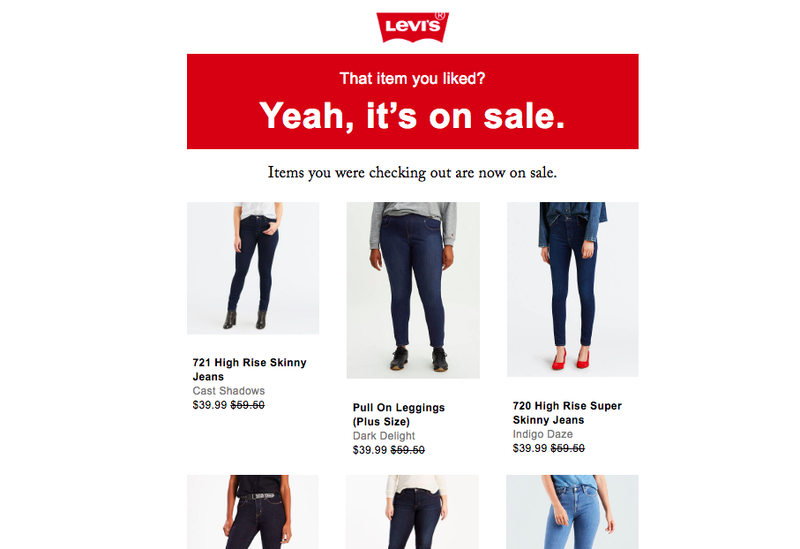 And here’s how world-famous clothing company Levi’s alerts the customer that the items they recently viewed had gone on sale. In both cases, the retailers were transparent about their personalization efforts. This builds trust and shows users how their data is used. It’s projected that by 2021 there’ll be more than 2.48 billion mobile messaging app users. As you can see, instant messaging as a trend is bound to continue well into 2019 and beyond. So, it’s on its way out? Absolutely not. Industry data shows that the number of email users worldwide is expected to grow from 3.8 billion in 2018 to 4.3 billion in 2022. There’s certainly room for both communication channels in consumers’ lives. That’s why in 2019, we email marketing and chatbots will be working side by side. We’re already seeing this happening today. 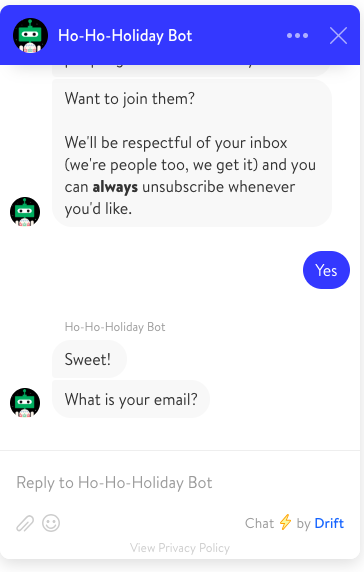 Take a look at how marketing platform Drift uses their chatbots to strike up conversations and collect email addresses, replacing traditional web forms. Other marketers are using both email and Messenger bots to communicate with subscribers. Take Law of Attraction expert Sarah Prout. 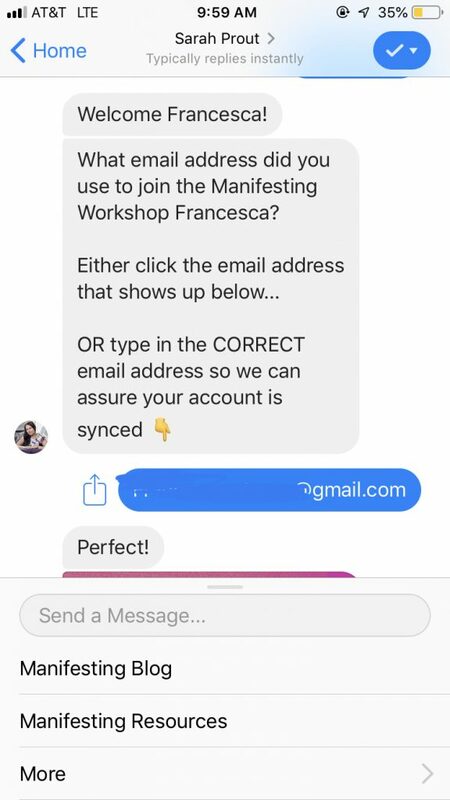 When you sign up for one of her workshops via a web form, she also asks for permission to send you messages via Facebook. Doing this allows her to get in front of her audience through multiple channels, so people never miss an update. It’s important to note that the right email + chat strategy depends on your customers, so take the time to study communication habits and preferences of your audience. How many of your customers prefer chat over email (and vice versa)? What types of messages do they want to receive and where? The answers to these questions will help you speak your customers’ language. Transactional emails are messages like welcome emails, password reset messages, and order confirmations that contain important information. The urgent and authoritative nature of these messages gives them higher-than-average open rates. In fact, according to Inner Trends, transactional emails have open rates of 40-50%. 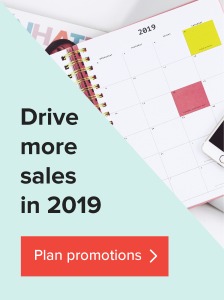 There’s clearly tremendous opportunity in these messages, which is why we expect email marketers to put extra effort into transactional emails in 2019. Those boring notification emails are on their way out. In their place, we’ll see beautiful, mindful messages that drive higher engagement. 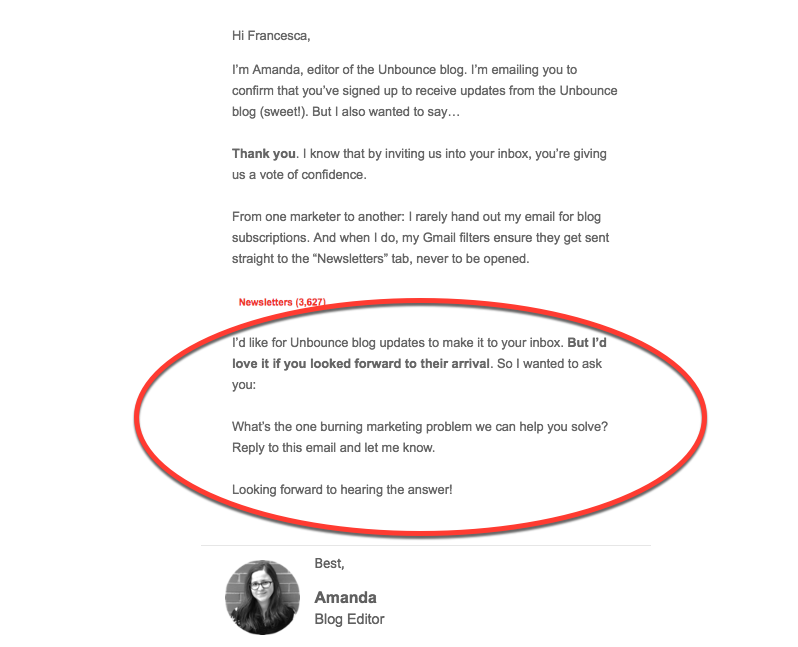 In their email welcoming newsletter subscribers, Unbounce grabs the opportunity to ask readers what their biggest marketing challenge is. By doing that, the company connects with subscribers and gathers valuable information about them. Things don’t always go to plan in e-commerce. When you face obstacles like shipping delays and out-of-stock issues, you need to notify your customers. Sending these types of messages isn’t fun, and they’ll likely lead to your customers being disappointed. But if you play your cards right, you could use these notification emails to make up for the experience. Check out this email from clothing rental Le Tote. When they informed a customer that the items ordered were out of stock, they were quick to apologize and offered a $15 credit for the next purchase. Shipping and tracking notifications is a good opportunity for connecting with your audience. 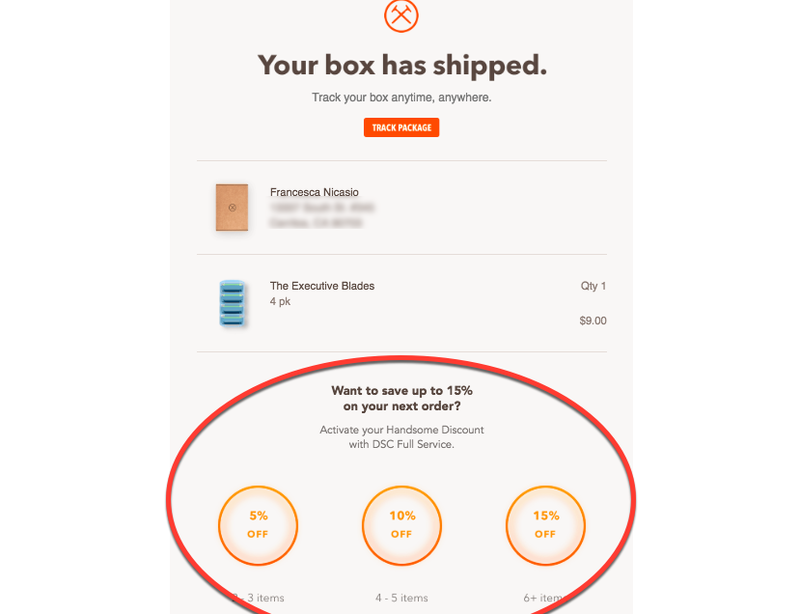 For instance, when Dollar Shave Club sends out their shipping notification email, they include a section about their DSC Full Service offering. These tactics can work well for you, too. Take some time to explore the possibilities. Is there an opportunity to gather feedback? Does it make sense to include a promo of your products or services? Review the transactional emails you send to your customers, and see if there’s room to be more creative with your email copy. Email will always be the core of your marketing strategy. But to keep seeing results, you need to keep one finger on the email marketing pulse. As you just saw, there are several trends you can try. 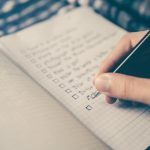 Start with the basics – being more transparent with your audience and toning down the creep factor in emails. Next, try experimenting with AI or interactive emails. And if these tactics aren’t the best fit, see if there’s anything else you can incorporate in your strategy. The most important thing, though, is to do something. Good luck and happy emailing! 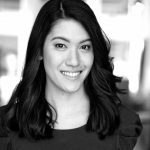 Francesca Nicasio is a writer and content marketer specializing in retail, ecommerce, SMB, and technology. She also recognized as one of LinkedIn’s Top Voices in 2018, and her work has been featured in Entrepreneur, MarketingProfs, Thought Catalog, and more. I am just starting my Shopify store with Printful being my main products for my customers, and I am so excited about their new products especially the cool jackets for men and women. Happy to hear it. Best of luck, Jeff!